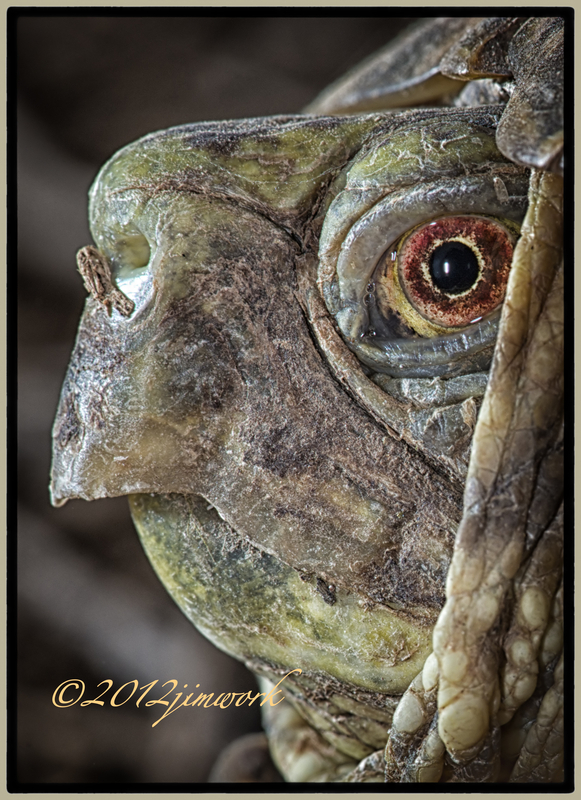 The Western Ornate Box Turtle, (Terrapene ornata) with its soulful face, baleful eyes, clumsy gate, indiscriminate diet and reclusive habits, would scarcely seem infused with charm. Yet the turtle, with its ornate shell, intriguing behavior, and sometimes humorous personality, rates as one of the Southwestern desert’s better known and more captivating reptiles. We came across this little lady in the cool weather this morning. You can tell it is a she by the yellow coloring on the legs & eyes, the males are marked with red . They are not picky eaters. I remember having one captive in my back yard as a child in Odessa TX that loved to eat tomatoes out of my hand. Ornate box turtles are chiefly carnivorous, although captive specimens consume a wide variety of food items from meats to vegetables. During a field study in Kansas, ornate box turtles were observed consuming the following: beetles, earthworms, caterpillars, grasshoppers, fish, a dead wood rat, snails, cantaloupes, tomatoes, strawberries, blackberries, green bean pod, a dandelion and even one specimen has been found stuck in a can of honey. Other documented food items eaten in the wild include: a recently killed black rat (Rattus rattus), bird carrion, a land snail, June beetle, persimmons, stick insect, mulberries, prickly pear cactus, and cow dung (Blair, 1976). The affiliation this species seems to have with cow dung is quite significant, as dung beetles can supply a considerable amount of the turtle’s diet . It is interesting to imagine what type of herpetological communities were present when millions of bison roamed the North American plains. The lifespan of the ornate box turtle has been reported to be from 32 to 37 years, with studies showing that males occur about half as frequently as females. The age of ornate box turtles has been estimated by counting growth rings for many years. This is similar to estimating the age of a tree but for turtles, the “rings” are lines that form on part of the shell that are like scales and the longer a turtle lives, the more rings are formed. However, using the rings to estimate age is not always reliable. The shell does increase in size as turtles get older, even though its weight makes it heavy to carry around. Pretty Turtle! I can honestly say I’ve never looked at a box turtle that closely before. That coloring information is interesting, how the females have yellow coloring and the males red. Very cool. I love looking at your daily photos, and I’ve been meaning to ask you; do you really take this amazing of photographs every day? Because that is impressive. If I’m lucky I get a shot or two a week that I would be this proud of. Yes, she is a pretty thing. I had never looked that close either. I do take a lot of images, it is my calling. I have been a professional photographer since I was 12 and I am 63 now, so I have been doing it a while. 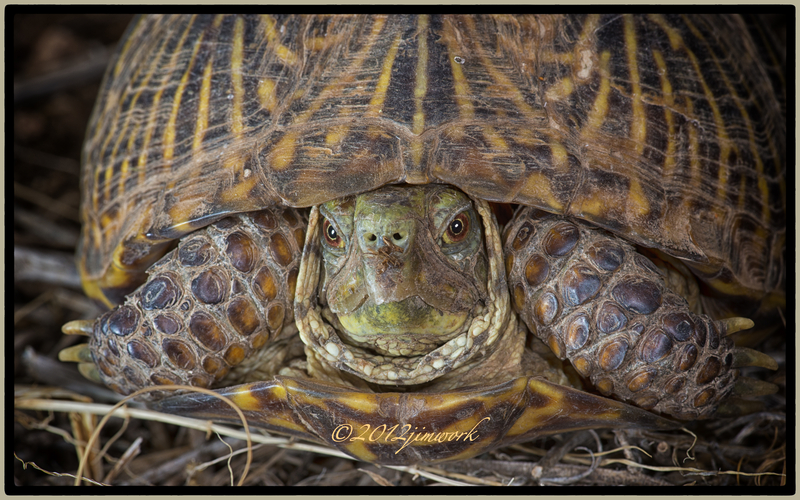 This box turtle was truly taken this morning. Some days I get one or two keepers, some day 6-8 and some days I can’t see or get a thing. Most all the images I post are at least made in the last 6 months or so. I try to always carry a macro kit (105mm Nikkor, D800 and 3 little flashes and a 300mm on a D300s with a 1.4 extender in my pocket. I also always walk with 2 dogs (one of which is totally deaf) and my marvelous muse/wife/soulmate and all around encourager. I switch to a 500mm F4’5 when I am seriously doing nothing but birds & wildlife. It is a monster and too much to carry all of the time.